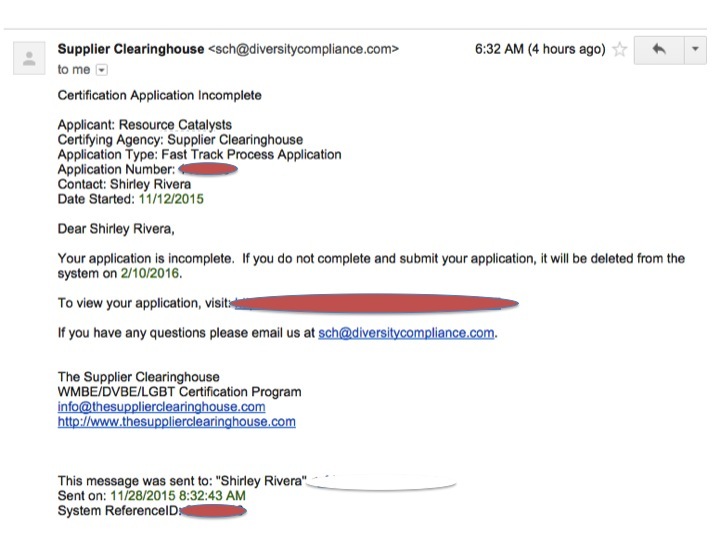 On November 12, R|CAT started the supplier diversity application process with The Supplier Clearinghouse. As shared in an earlier post, the Clearinghouse has a 90-day duration until the application is deleted, if it has not yet been submitted as a complete application. To date, R|CAT has received two email reminders on November 20 and November 28. Below is an image of the email received November 28, which is the same content as the initial reminder. This every-eight-days reminder is a good trigger to chip away at the remaining information during the Thanksgiving holiday weekend. The bottom line – 74 days remaining.